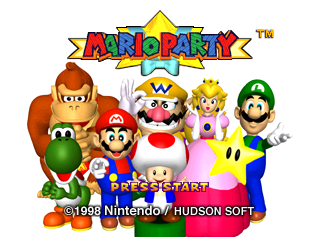 Mario Party is one of the first games that try to tie real-life friends into the world of video gaming. The success usually depended upon whether or not the game's owners had any real-life friends. It's spawned a large amount of sequels, released mainly on home consoles, but there have also been GBA, DS, 3DS and e-Reader entries for the series. Use one of these GameShark codes and hold L before a screen transition to access the debug menu. Note that the Donkey Kong render in the background is just a silhouette with a question mark in it, which may indicate the debug menu was created before the Donkey Kong model was finished. This large list contains all of the game's Mini-Games, and then some. Selecting a Mini-Game with A goes to the character select screen. Press Left/Right to choose your character, A to confirm your character, and Start to start the Mini-Game. Also, pressing the R button changes the game mode. Pressing B goes to a save data clear screen. Pressing Z on the game list opens the options menu, where you can set various player options. This appears to be a test room. 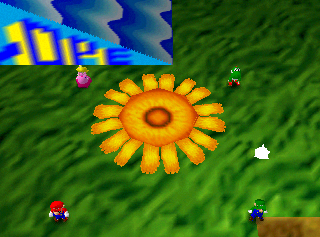 In the center of the room there is a large sunflower in the middle (from Coin Shower Flower), a slope where you can slide down, and a spinning thing that hurts everyone. Further to the left, connected to the slope, is a connected flight of steps. At the top of the steps and slope there is a bright blue rectangle sitting at the top that you cannot jump onto. At the top right corner of the room, there is a tall tower you can climb up via the slope in front of the tower, however it isn't hollow, so you fall right through it once you get to the top. At the bottom of the room, there are four different moving blocks with three different values written on them. The smallest is to the right where the dirt patch is located at the bottom right corner, and it has the value of "0.5". The second biggest is to the left near the slope and has the value of "15". The third and fourth sized blocks have the same value, but different sizes, and the value written is "25". This is a strange game mode. It works similar to the main game, but there is no board, instead random Mini-Games are played one after another. 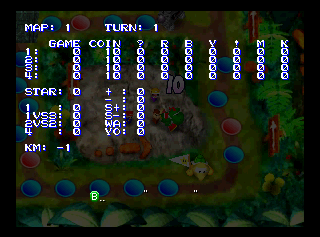 The tally screen displayed between the Mini-Games doesn't otherwise appear anywhere within the game. It appears to use the same pictures that are used as the background in the debug menu, including the "missing" DK render. There are no explanation screens and no results screen. All kinds of games are selected; 4-player games, 2-vs-2 games, 1-vs-3 games and one-player games. The position of the players is determined at random, displayed on the screen using "MAIN" and "SUB". Pressing B changes the Mini-Game which will be played, even allowing one to access the dummied out "All or Nothing" Mini-Game detailed below. This was more than likely a debug test of the Mini-Game randomizer which appears at the end of each turn. This doesn't seem to be available via Debug Mode, but can only be reached directly by GameShark. After one game is played, it seems to return to the game no matter what. Otherwise, except for the background being orange, it is really similar to the Random Play above. To warp yourself to this mode, use the GameShark cheat 800F09F7 007E. It is recommended to enable this code from the debug menu or else every character will be Mario. The top row denotes the map number and how many turns have passed. The next four rows show each player with how many coins they won in games, how many coins they acquired in total and what spaces they stepped on and how often, in the order happening, red, blue, 1-player, Chance Time, mushroom and Bowser. Below that the game keeps track of how many Mini-Games of each type were played so far (1-player, 4-player, 1-vs-3 and 2-vs-2) and how many stars were acquired. To the right of that, the game keeps track of how many times each special block has appeared, in the order Plus, Minus, Speed, Slow, Warp, and Event. The meaning of "KM" is unknown. The GameShark Code below will draw a frame around the screen specifying the portion of the screen safe to use for UI elements. The frame starts 24 pixels from the left side and 16 pixels from the top side of the screen. The frame is 272 pixels wide and 208 pixels tall. Here are all the graphics related to this black 64DD screen. Notably, it appears that there were error codes that could be displayed. 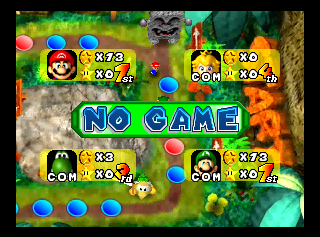 These graphics also exist in Mario Party 2, though the functionality does not. There are a few Mini-Games in the code that are never actually used. This Mini-Game is called いちかばちか (All or Nothing) and the explanation screen appears to be for an early version of Chance Time. 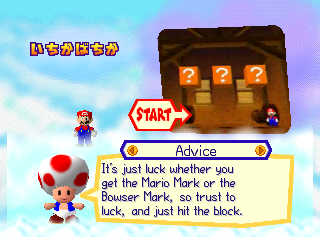 Instead of various symbols to transfer stuff between players, however, according to the unused advice text, the blocks featured Mario and Bowser marks, and you had to get the Mario mark to win the game. 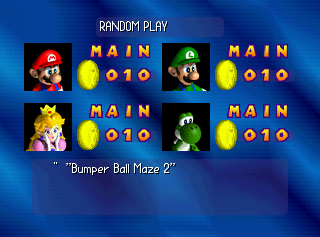 This Mini-Game was likely removed because it depended too much on luck, although it can be accessed via the debug menu and Random Play. As can be expected, you are taken to the final version of Chance Time after leaving this screen, although due to the unusual means of access, it is prone to freezing if two players are meant to appear on-screen. This Mini-Game can be accessed with the GameShark code 810ED5DE 0001. Called ツールドマリオ (Tour de Mario) in the game, this appears to have been a cycling Mini-Game. The preview icon, strangely, is a black image with the text "Now Printing!" on it. There's also large Japanese text overlaid across the explanation screen that says "under construction." It likely was simply not finished in time. Strangely, starting this Mini-Game takes you to Bumper Ball Maze 1. Use the GameShark code 810ED5DE 0030 to access this Mini-Game. In the ROM, one can find the string "Bungee Jump". However, the explanation screen of this Mini-Game cannot be triggered; the game freezes before it appears. It was most likely cut in the early stages of development. It can be "accessed" through the GameShark code 810ED5DE 0038. 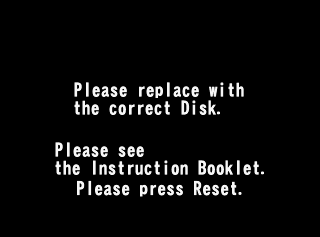 Though the description has been removed, the advice page and controls can be found within all versions, with the controls even being translated to English. 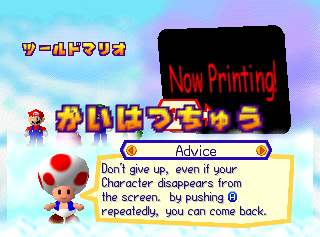 Curiously, the Japanese advice page uses five lines, while the maximum that can fit in Toad's message box is four. In addition, the word "Coin" is not written in yellow as it is in other Mini-Game descriptions. In the USA ROM, the advice is found at 0xFDA538 and the controls are found at 0xFDE300. おたからが　とれます。 The bungee cord can stretch a bit. If your timing is right, you'll get the treasure! A game with the same name appeared later in Hudson-developed Sonic Shuffle, though it is unknown if it is related. This Mini-Game is actually fully functional, and can be played through the use of a GameShark code. It is a 1-player game which works just like the actual Same Game. The tiles are underneath your character, and you ground-pound to remove sections. If you manage to clear all of the tiles, you can grab the treasure chest underneath; otherwise, you must go through one of the doors, which nets you a single coin. To play this game in the North American version, use the GameShark code 800F09F7 0006. This Mini-Game is partly functional, but obviously still incomplete. Characters sit atop a Yoshi on the left side (unless you are Yoshi, in which case you're just standing in the same pose without a rider), with a baby Wiggler on their tongues. The tongue extends to the Wiggler's mother and you have to unite them by pressing A at the right moment. Too soon, and they won't reunite, too late and the baby will kick its mom into the bush. The music and sounds are all broken in this Mini-Game, and there's debug text which shows whether or not you succeeded. Also, as with Same Game, no explanation screen exists. To play this game in the North American version, use the GameShark code 800F09F7 0008. ...a big "NO GAME" sign appears, and the game moves on to the next turn, without playing a Mini-Game. 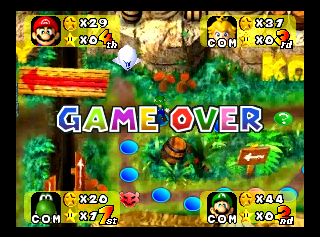 If it's the last turn, a GAME OVER will appear on the screen. The board ending will then play as usual. This is the last Star‚ so good luck‚ everybody. In the final game, Stars spawn infinitely until the game is over. There are (NUMBER) Stars left on this map‚ so be quick about finding them! Possibly related to the above. Oh! The results are in! Why, (NAME) and (NAME) switch places. All right now, go ahead and switch. at least I thought so, but they're on the same space. It appears one of the Chance Time results used to switch two players' positions. These low quality character graphics, most of which are rips of official artwork from Mario Kart 64, are found in the ROM filesystem. Perhaps they were used before the final graphics were made. An alternate texture for the Shy Guy pirate in Shy Guy says is present, but isn't used. Slightly different face textures for all the characters (except Wario) exist. Chance Time has four crudely made unused textures, which are the numbers zero through three, written in katakana for zero and hiragana for the others. In addition, the "Marks" from when the game was known as All or Nothing still exist. A few odd, recolored mushroom graphics exist in certain Mini-Game graphic banks and general graphic directories. As they are the same size as the used coin graphics and there are some Mini-Games that support multiple collectibles, it's possible these were meant to appear during Mini-Games. These Star sprites appear in a similar capacity. While Stars do of course appear in Mario Party, these graphics do not. Finally, a sign with one of the mushroom graphics on it is stored with the similar used signs in Buried Treasure. Graphics exist for a rough Dice Block that only counts a few numbers. These graphics still exist in the next two games. The branching path roll that appears in Bowser's Magma Mountain appears to have gone through a few revisions. The font from Super Mario 64! 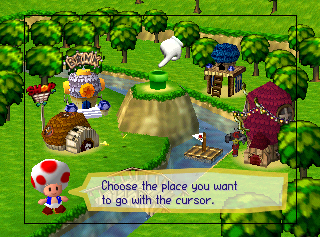 This font appears, also unused, in Mario Party 2. There is an assortment of unused graphics grouped together. Many of these have a fancier / flowery appearance. 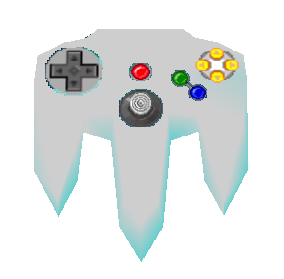 In the same directory as the Mini-Game explanation graphics is this simple model of a Nintendo 64 controller, possibly used at one point to demonstrate the controls. 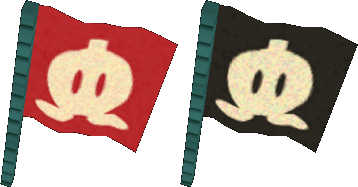 Models for the Bob-Omb flags in Wario's Battle Canyon exist, but are never actually seen in-game. A short two-note tune likely used for testing purposes is the first music track in the game, and can sometimes be heard when entering the Debug Menu. 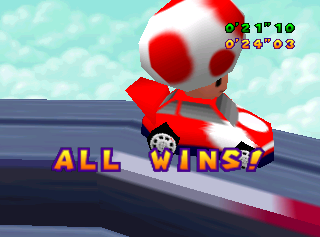 The Mini-Game Slot Car Derby is used for a final showdown against the typically unplayable Toad during the Mini-Game Island mode. However, if a player's character ID is modified to 06 and the Mini-Game is started outside of that mode, winning will reveal that the game uses "ALL" as the string for Toad's name (under normal sequences, the screen fades out and the string is not shown). 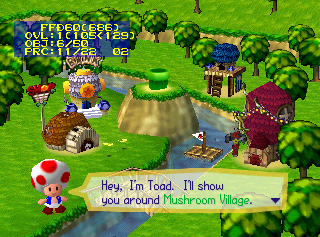 In addition to this, if the player using Toad sits still long enough to be bumped off the course by another player, Toad will exclaim his "Happy" voice clip while falling off. He does not make a similar sound if he wins. While normally only coins fall from above at the end of a minigame, two unused objects were also supposed to fall which would award two and three coins, respectively. It's unknown which object graphics they were supposed to use but there's graphics for a star and a 1-up mushroom, seemingly unused, that happen to match the sound effects used when collecting the unused objects nicely. The international versions changed the PUSH START text to PRESS START and merged both copyrights into a single line. The track "Move to the Mambo" is used in the Japanese and European/Australian versions, but not in the American version. There are two Mini-Games which use the song, and their replacement songs are listed below. GameShark code 800CDAFD 0018 will load "Move to the Mambo" in place of the current screen's music. Two of the characters' voice clips have been replaced in the US and European/Australian versions due to religious references. 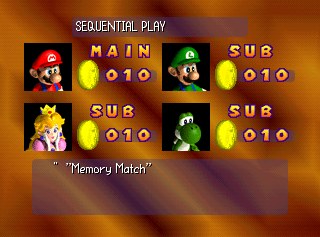 These replacements are maintained in all versions of Mario Party 2. 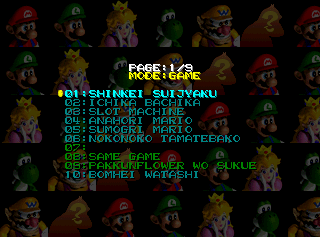 In the Japanese version, the background that appears in the Face Lift Mini-Game reads "Super Koopa 64" while all other versions read "Super Bowser 64". 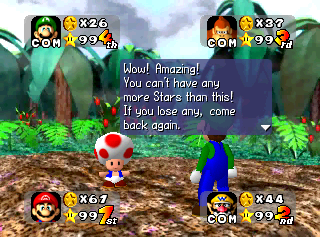 If you somehow manage to get 99 Stars in one game, when you meet Toad, he'll tell you that you can not have any more Stars. Although the message isn't unused, it's very unlikely that anyone has ever seen it without cheats. The following strings can be found in all versions. These offsets are for the Japanese ROM. This page was last modified on 15 April 2019, at 11:24.